Attacking midfielder James is a graduate of City youth academy. 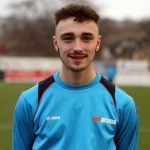 He made his first team debut in the Somerset Premier Cup during the 2016-17 season before adding a further four outings, including a league debut at Dartford, during the 2017-18 campaign. He continued this progress by signing a first team deal for this season. James spent the first half of the campaign on loan with Keynsham Town. Currently on loan at Mangotsfield United.